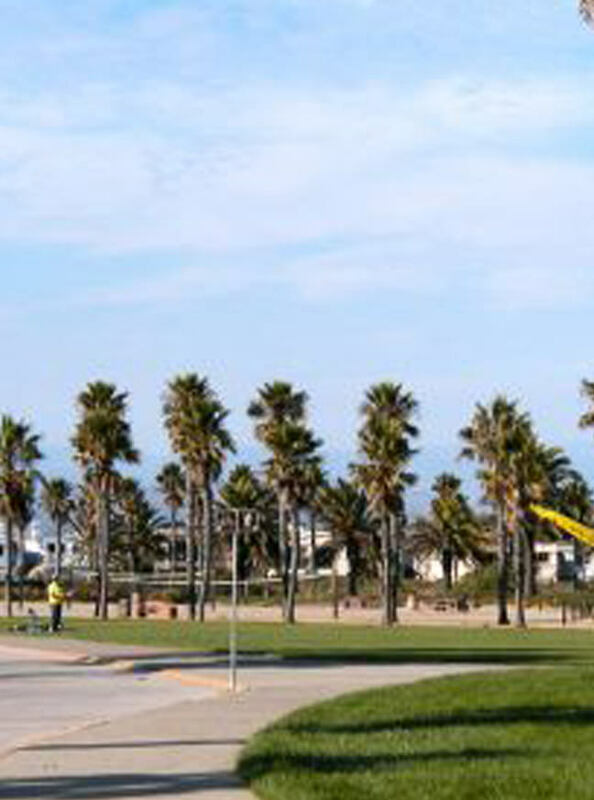 Oxnard Beach Park has a large lawn with palm trees, an accessible playground, dunes, a sandy beach, and picnic areas. There are also some picnic tables along Rehab Point Path, a 900-foot accessible paved loop behind the beach. Rehab Point Path •Trailhead: From parking lot, follow wide walkway toward beach. Three marked entry points for Rehab Point Path are near the restroom. •Length: Less than .5 mile •Typical Width: 4 ft. & above •Typical Grade: Level •Terrain: Hard •Obstacles: There's a several-inch gap between the picnic pad and the boardwalk onto the beach. Sand may blow onto the path. Rehab Point Path is a stellar example of beach access. This paved loop is a spur off a path that follows along the beach south from the park, past apartments and a luxury hotel. The loop travels through dunes to picnic tables on a concrete pad, providing sweeping views of the ocean. Accessibility: •Beach Wheelchair: Yes •Reserve 24 hours in advance; call either Harbor Patrol, (805) 382-3007, or main lifeguard tower, (805) 382-3018, to have it delivered to park •Accessible Parking: Yes •In the fee lot. For free curbside parking along the park’s perimeter road, veer left before entering the fee lot. A disabled parking placard is required, and grass along the curb may cause problems for a wheelchair lift. A free lot at Sunset Lane has accessible spaces that are not clearly marked and may be covered with sand. •Accessible Restroom: Limited Accessibility •By fee parking lot. Grab bar on back wall only •Accessible Restroom: Yes •At entrance to Rehab Point Path •Accessible Picnic Tables: Yes •Only one of the tables by the park’s play area is on a concrete pad; others are scattered on the grass.